Tokio Wo Kakeru Dexter. I can't read japenese, if I could I'd tell toi what the the letters at the bottom meant, I only spelled the pics name that way, cause that's how I found it.. Wallpaper and background images in the Dex3fan club. this only proves three things, number12 is a coward, Dexter grows up bald, and old Dexter strangely has hair,Oh wait make that four things, also, old Dexter is UGLY! 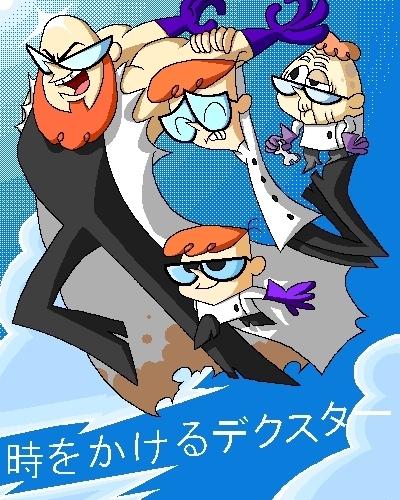 that is very weird though.....old Dexter has hair, yet..adult Dexter is bald with a beard.......maybe he shaved the beard and made a wig?.....hmmmm.......I dunno where I'm going with this train of thought!.......MONKEY! LOL yeah maybe he shaved his beard of and made a wig its a crazy world what do u mean by number 12? Dexter as ayoung adult when mandark took over the company Dexter was working for, made everyone change their names to a number. Dexter was then forced to become scaredy cat number 12. Oh yeah I haven't seen that episode in a while but now that you mention it I remember that it is hilarious!!!!!! Baily:Oh mom he was nerdy all his life!!! !